This photo shows the sting of a Asian Hornet. A wheelchair-bound 87-year-old pensioner who was attacked by giant hornets in Japan and stung 150 times has died, a firefighter said Friday, as emergency workers stood by powerless to help her. A swarm of hornets swooped on Chieko Kikuchi as she was on her way back from her care centre in western Japan, accompanied by a helper. The helper called firefighters but they could not reach the woman immediately as the swarm around her was too thick and they had no protective equipment. After the ordeal, which lasted around 50 minutes, the woman was rushed to hospital but died the following day, the firefighter said. "It was an unusual operation for us," he admitted. The death occurred in mid-September but was only reported on Friday, making headline news on national bulletins. A forestry agency official said hornets often attack people when their nests are affected. 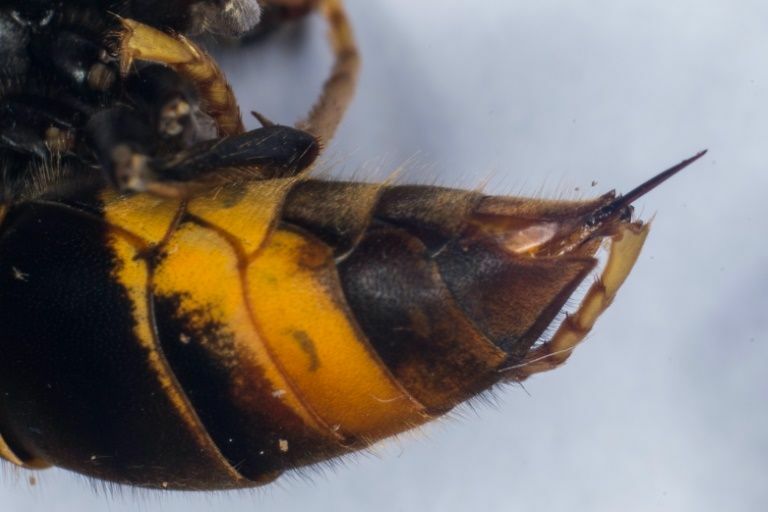 "To avoid getting stung by hornets, you should keep away from their nests, wear protective jackets and use a wasp killer spray," the agency official said. Some 20 people die from hornets stings every year in Japan, according to public broadcaster NHK.